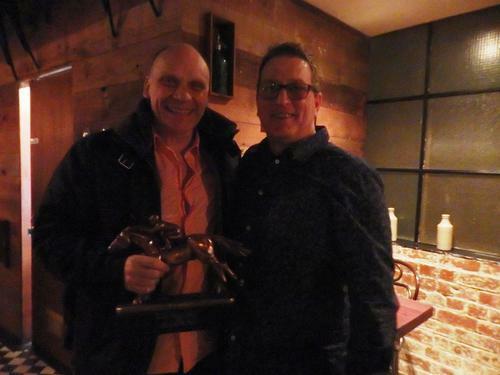 Stephen Hanlon was the deserved winner of our 2015 Owner of The Year. Stephen has been a long term owner and has had many shares in horses with us, his best FAST CASH who was stakes placed last preperation and looks set for a good 2015 Spring campaign. Stephen said " Just wanted to thank you for Saturday Night. Your recognition of your Owners is greatly appreciated and is a testament to the approach I have experienced with Ken King Thoroughbreds. You look to create great value horse ownership options and then run the operation in an unstated yet professional manner. The opportunity to own multiple horses across different parts of their career, whilst also have Breeding involvement means, as an owner, I can have a long term and engaged relationship in a big industry. I appreciate you and your team's honesty and openness in an industry that, at times, doesn't necessarily hold those ideals as important. have no hesitation in recommending Ken King Thoroughbreds to anyone looking for the ride of a lifetime."